You will find no shortage of natural beauty in Jackson County’s small mountain towns. 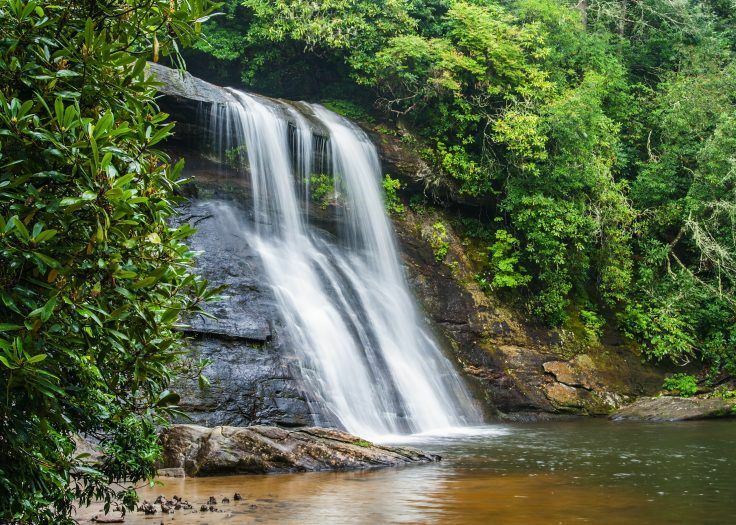 Sweeping views of the mountains and nature surround and challenge you to delve a little deeper to uncover some of the most popular, and more well-hidden waterfalls. Visitors can discover more than two dozen waterfalls in the area ranging from cascading falls, to gentle flows, all which make for one-of-a-kind photo opportunities. 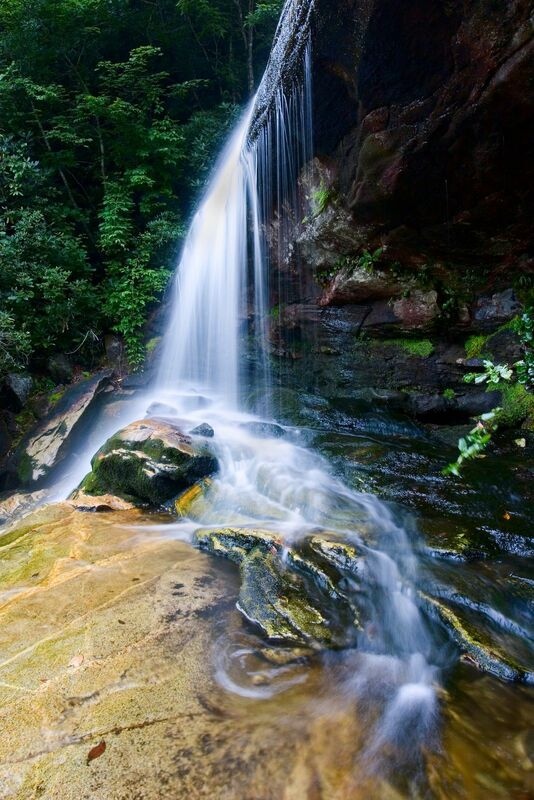 Below are a few of the most popular waterfalls you can find while exploring our county. Visitors to the area can find more details on how to spot these hidden gems by visiting the waterfalls section of DiscoverJacksonNC.com. Access to the wildly popular Whitewater Falls is scheduled to re-open July 4th. This astonishing waterfall is one of the tallest east of the Rocky Mountains and is defined by its lofty height. At a colossal 350 to 400-feet Whitewater Falls is accompanied by a quarter-mile walk to the top overlook on a paved path. Additionally, the falls have a lower view platform that can be accessed from a steep set of 154 wooden stairs. This is highly recommended for guests who can manage, as the view is one not to be missed. Plan a trip to explore the rugged terrain surrounding the falls and lookout over the scenery from a breathtaking vantage point. Directions to access here. At 100 feet, High Falls can have either a powerful, cascading flow or a trickling stream, depending on the select dates of the Duke Energy recreational water release. When the water from the dam is released, High Falls roars and creates enough power to create class IV and V rapids in the West Fork of the Tuckasegee River. 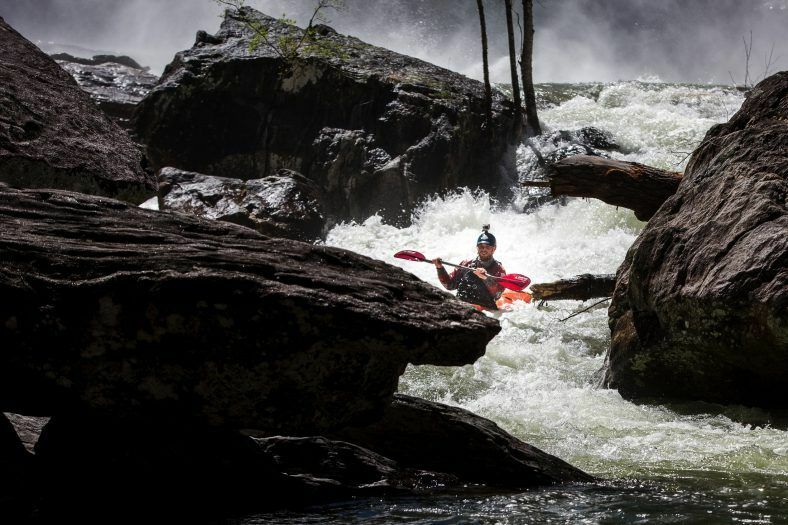 Kayakers enjoy tackling the five-mile journey, while hikers can descend 0.6 miles down stairs from the Upper Trailhead to see an up-close view of High Falls. Directions to access here. For those seeking an easy find and short walk from the car, Silver Run Falls is one of the most photogenic. The 40-foot cascading waterfall tumbles into Silver Run Creek. The large, sandy pool is calm and glassy, ideal for swimming in the shallows, or having a picnic on the banks. The falls are just a short walk from the parking lot on U.S. 64. Directions to access here. 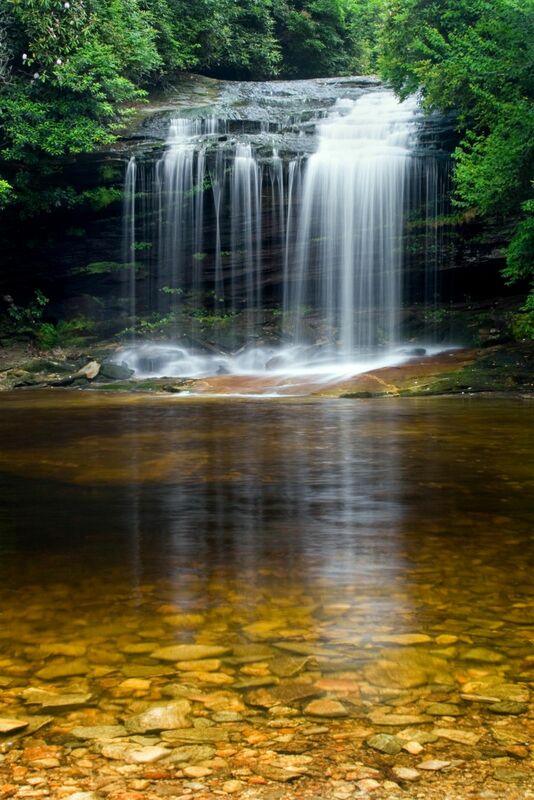 Schoolhouse Falls is the most well-known waterfall of Panthertown Valley. At 18 feet, it’s a mix of small cascades ending in a free fall from Greenland Creek. Schoolhouse Falls was named for a historic schoolhouse that was in the same location back when the valley was populated. Make an afternoon out of it and enjoy a hike on the Little Green Mountain trail, which is located right next to the falls and offers breathtaking views. Be sure to pack a picnic and sit on the sandy beach across from the falls for lunch with a view. Directions to access here. Granny Burrell Falls has one of the largest waterfall pools in the state, and a 12-foot natural slide. Sunbathe on the sandy beach or wade in the massive pool, perfect for a mid-hike cool down. Directions to access here. The beautiful two-part cascade of Greenland Creek Falls features an upper and lower waterfall that tumbles 45 feet from Greenland Creek into a wide pool of moss- and lichen-covered boulders. The water is clear, but stained with a brown tint by with the tannins from the surrounding leaves and trees. Directions to access here. Never climb on or around waterfalls, and never play in the water above a waterfall. Rocks can be slippery and it’s easy to lose your balance, especially with bare feet. Currents near waterfalls can be extremely swift even in areas further upstream. Never jump off waterfalls or dive into plunge pools at the base of waterfalls. Rocks and logs can be hidden beneath the surface of the water. Often waterfall pools have swirling water or currents that can drag and keep you underwater. Waterfalls are constantly changing with varying water flows and erosion of the rocks around them.